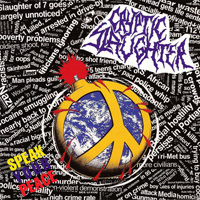 The original Speedcore merchants, Cryptic Slaughter dealt a West Coast hand into the late 80′s Crossover movement, a movement that saw the normally warring armies of punk rock and thrash metal finally come together into a unified front bent on exposing social injustice and political hypocrisy. Powered by a previously unimagined sense of informed aggression, the band’s uncompromising political stance and lightning-fast tempos ultimately proved too harsh for mainstream tastes, but their status as underground legends remains unquestioned. 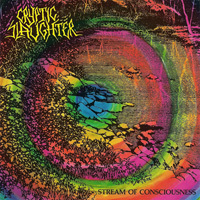 Vocalist/bassist Bill Crooks, guitarists Les Evans and Adam Scott, and drummer Scott Peterson first met while playing on their High School soccer team, and formed Cryptic Slaughter in 1984. Adam Scott was soon on the outs, but the remaining trio still managed to cut their five-song Life in Grave” demo by May of the following year. 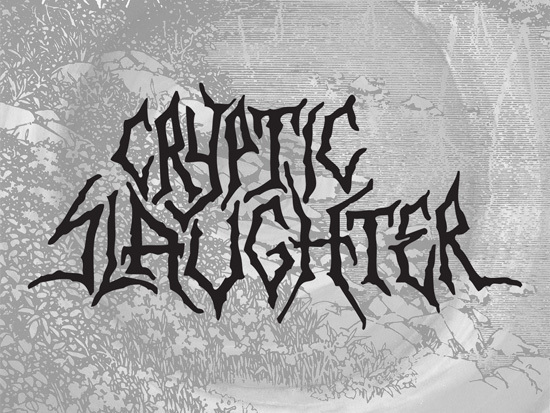 Its sheer speed and unbridled ferocity quickly made it a favorite conversation piece on the all-important underground tape-trading network — a worldwide phenomenon that had already launched dozens of successful acts before them — and eventually landed Cryptic Slaughter a contract with fast-rising independent Metal Blade Records. Issued in 1986, the band’s debut album Convicted introduced new bassist Rob Nicholson (freeing Crooks to focus on his rabid vocal delivery) and somehow crammed fourteen tracks into a violently giddy, adrenalin-charged half hour, every single cut spewing a torrent of anti-establishment bile and fury. Follow-up efforts like 1987′s Money Talks and 1988′s Stream Of Consciousness added only the smallest of sonic refinements, and kept the group’s ever-expanding legion of fans happy by staying true to their original, raw and frenetic style.